More than 16 million American troops served during World War II -- more than 12 percent of the U.S. population -- and they served an average of nearly three years. Of that total, more than 400,000 were killed, and nearly 700,000 were injured. The loss of so many young men had a major impact on nearly every business and industry in the country, from factories and farms, to professional baseball, to the Los Angeles Police Department. While women replaced men in the factories and on the farms, the LAPD scrambled to find replacement officers and get them on the streets. At the Police Academy, training was cut from three months to six weeks, and the department hired special "War Emergency" officers. In some cases, the emergency officers eventually made the transition to become regular members of the department. One of the LAPD's "War Emergency" officers was Norbert John "Bert" Huseman, who completed Academy training and joined the department on Sep. 26, 1944. Huseman was born May 6, 1912, in Nazareth, Texas, a small town south of Amarillo. He was the fourth of eight children born to Charles Joseph and Mary Margaret Kehl Huseman. Charles Huseman was a farmer, and also raised sheep and cattle. Due to the crushing twin blows of the Great Depression and the Dust Bowl drought of the early 1930s, Charles lost the farm, and the family moved to Natchez, Mississippi, where Charles found work in a sawmill. When the rest of the family moved east, Norbert Huseman headed north to look for work, to Denver, Colorado, where he met and married Esther Amelia Micheli in 1936. After spending a short time in Colorado, the Husemans moved to Natchez, where Huseman worked with his father and two brothers at the National Box Co. Most of the Huseman family members -- parents, brothers, sisters, spouses and children -- lived within a few blocks of each other, not far from the Mississippi River. 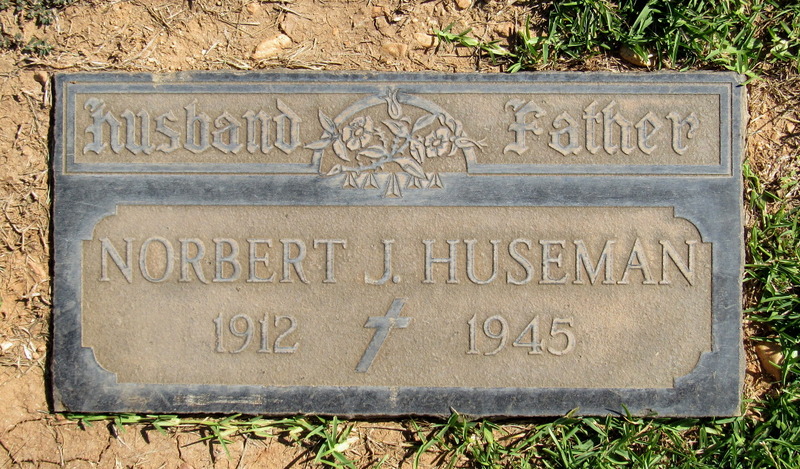 In 1939, Huseman's father died of a heart attack at the age of 51. Shortly after, the family decided to move to Southern California -- with the exception of Huseman's younger brother, Anthony, who remained in Natchez and joined the Natchez Police Department. In Los Angeles, Huseman first worked for the Firestone Tire and Rubber Co. When Huseman joined the LAPD in 1944, he and his wife had four children -- two boys and two girls, ranging in age from 9 years to 10 months old -- and lived on Temple Street, just west of Alvarado Street. By late 1945, Huseman had been with the LAPD for more than a year, and was working out of the Newton Station. World War II had been over for a few months, and Huseman was taking steps to transition from "War Emergency" officer to regular member of the force. He was scheduled to take the exam to make the transition complete and official in January 1946. At about 12:30 a.m. on Saturday, Dec. 22, 1945, Huseman was driving in a radio car with another officer when they were called to respond to a disturbance and a shooting at Enterprise and Mateo streets, where two men were fighting over the ownership of a baby carriage. One of the men reported that the other man had fired a gun at him, with the shot grazing his head. Huseman got out of the car and spoke to one of the men. He was joined at the scene by Det. Louis Knapp and Det. Daniel Fredburg, and the three officers went to the door of the man who was accused of firing the gun. The door was slightly open, but it was dark inside. Huseman shined his flashlight into the hallway, and ordered the man inside to come out. Instead, the man started shooting at the officers, who returned fire. A total of 18 shots were fired before the man surrendered. Knapp and Fredburg suffered minor injuries, but Huseman was hit in the stomach. He was taken to Georgia Receiving Hospital, where he died nine days later, on Dec. 31, 1945, leaving his wife, Esther, and their four young children. He was 33 years old. Since Huseman was still a "War Emergency" officer at the time of his death, and not a regular member of the department, his family was not eligible for financial assistance from the police relief fund. Huseman's fellow officers, however, started a collection to buy a home for Huseman's widow and children, with any surplus money to be placed in a trust for the children. Huseman's killer was found guilty of second-degree murder, sentenced to five years to life, and sent to San Quentin State Prison. Huseman's sign is located on the northeast corner of Enterprise and Mateo streets, just north of the 10 Freeway and a few blocks west of the Los Angeles River.